March 25, 2014 (Mimi Al Laham) - The downing of a Syrian jet by Turkey was not an isolated incident but part of a major offensive by Al Qaeda affiliated groups Jabhat Al Nusra (designated a terrorist organization by the US State Department) and Ahrar Al Sham against a northwestern Syrian-Turkish border crossing. Turkey has been supporting Al Qaeda’s attack on the Kassab border crossing, the only crossing that was still held by the Syrian military. While the AFP did report that the group involved in the attack was the AlQaeda faction Jabhat Al Nusra , this fact has not made it to any mainstream media headline. Another Al Qaeda offshoot fighting along side Jabhat Al Nusra in the offensive is ‘Ahrar Al Sham’. While the rebel group is not yet designated Al Qaeda by the US State Department, the group was founded by Abu Khaled as-Suri, Al Zawahiri's ambassador to Syria. Ahrar Al Sham was described as ‘Al Qaeda worth befriending’ by the Council on Foreign Relations (CFR) Washington’s premier think tank. Charles Lister, a fellow at of the Brookings Institution, tweets video of Ahrar Al Sha’am taking part in the attack on Latakia. 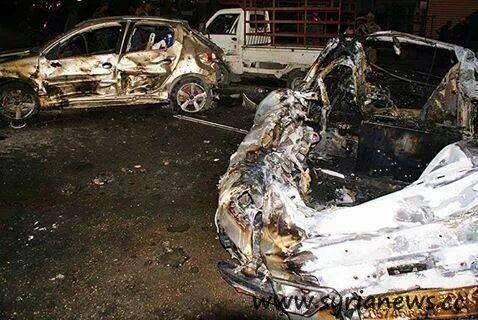 Image: Al Qaeda rockets fall on Latakia province, killing 7 and injuring 30. It was reported that Turkey had begun shelling inside Syrian soil to back the offensive on the border point. Turkish artillery and tanks targeted Syrian positions, and Turkish special forces have been observed in the region. A Lebanon based satelite channel Al Mayadeen TV reported that the Syrian Army launched a counterattack on the border point Nabie Al Murr with Turkey , along with dense artillery cover. In response to the Syrian defensive measures against the AlQaeda attack, Turkey downed a Syrian jet that was firing on the Al Qaeda militants from Syrian airspace. Turkey’s claims that the Syrian jet violated Turkish airspace is contradicted by the fact the plane crashed over Syrian territory as shown in a video posted by Al Qaeda in the area. The pilot managed to safely eject and was picked up in Syria, and was even interviewed by Syrian state TV. The Al Qaeda attack and takeover of the Kassab border crossing has caused up to 2000 to 6000 Armenian Syrians to flee the area. Mass looting and destruction of religious sites was reported by residents (similar to criminal acts carried out in the recently liberated city of Yabroud). Armenians are once again refugees due to the Turkish government like their ancestors who fled the Armenian Holocaust decades ago. There has been no mention on the BBC of NATO’s open support for Al Qaeda groups. The attack comes in the backdrop of mass rallies against Turkish President Erdogan, who recently banned Twitter. The battles in Latakia are ongoing, with the Syrian military inflicting heavy losses on Al Qaeda militants.